Meet Our New Summer Intern! Shanti Sandosham is a Ventura born and Malaysian raised student at Ventura College. Since moving back to California in August of 2015, Shanti has completed her first year at Ventura College earning two scholarships, including an Edison STEM scholarship for women. She hopes to transfer to an in-state university as an Agriculture major. Shanti has volunteered with Food Share and SOAR and is excited for the opportunity to work at HAREC where she will be learning the process of how to plan and deliver agriculture and food systems youth education. Shanti has already helped with farm field trips and Nutrition & Fitness Night at Sycamore Canyon School where she inspired students to sample healthy Strawberry & Kale smoothies made on the Center's new blender bike. She has completed the Sustainable You! Summer Camp training and is ready to co-lead the program which begins June 20. When asked how she feels about this opportunity, she stated “ I am ecstatic to be working with such an inspiring center and I'm certain that this work experience will help me in future endeavors to one day work in the agriculture field in less developed countries such as my home country of Malaysia”. 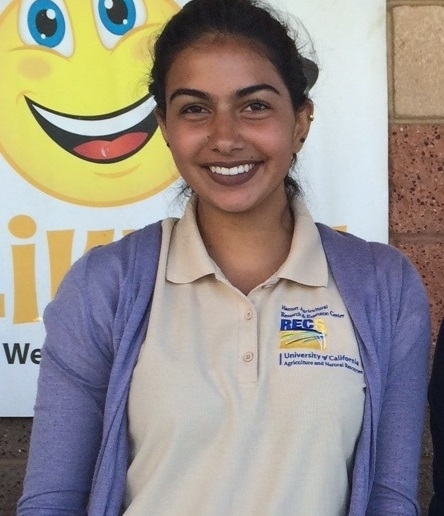 Welcome Shanti as our 2016 Youth, Families, and Community summer intern!